Good news! A sonnet of mine, titled “Train I Ride (1953)” has just been published in a very cool online journal called The Museum of Americana, as part of a special music issue. This, of course, is right up my alley. I wrote the poem in 2003, submitted it a few places at the time, but I am recently seeking homes for a few old poems that I think deserve some attention and some light shining on them. This one’s a favorite. It’s my loosely-based-in-reality imagining of an awkward blues-obsessed Memphis teenager named Elvis Presley getting to meet and talk with local DJ and guitar hero Riley “B.B.” King. That’s the true part, along with Mr. King being pretty nice to the kid. But the scene I’m painting is imagined, not based on any existing account of a real meeting. I’ll link to the poem at the end of this entry, and I hope you’ll go read it after this behind-the-sonnet background. So, some of y’all are familiar with my poem “Riley’s Blues,” which is more or less a superhero origin story for a certain recently-departed genius blues guitar player. A couple of weeks ago, I had the chance to perform it with Wammo accompanying on bluesy harmonica, as part of the Austin Poetry Slam 20th anniversary show, and it’s been published a couple of places, including this excerpt in the San Antonio Current years ago, to promote a B.B. King show (which means there’s some chance Mr. King actually read a few lines of my poem about him, so how cool is that?). Anyway, here’s the background story of two poems: “Riley’s Blues,” and this sonnet that I’m so happy to finally see published. It starts with my brother. My brother Guy, who died in August of 2003, was an Elvis freak. Spend any time around him, and you found yourself in an Elvis-heavy environment. Skinny Elvis, fat Elvis, early Elvis, late Elvis, gospel Elvis, Vegas Elvis, Hollywood Elvis, it didn’t matter. For Guy, it was all good. Sometimes the fixation became annoying. He’d come to the breakfast table, and instead of reading the newspaper, he’d have the latest Elvis biography and he’d read passages aloud. No context. He’d just launch. To me it sounded very much like that old Far Side joke: “Blah-blah-blah-Colonel Tom Parker; blah-blah-blah-Elvis’s dead twin; blah-blah-blah-Elvis’s sorry excuse for a father, blah-blah-blah-Sun records,” and so on. And so on. And, God help us all, soooooo onnnnn. I tried to be patient. My brother was, cell by cell, being destroyed by Huntington's Disease, the disease that had also killed our father, and for a while, Guy lived with me at my house and I took care of him. I tried to provide patience and love, and I (mostly) pulled that off for almost four years, till he got a lot worse, and went to live with our mother. She hired a full-time nurse and so was able to keep him at home until the end. But this isn’t mostly about my brother; it’s mostly about two poems and how I came to write them. It’s about how way leads on to way, to steal a line from Robert Frost. It’s about what one sets out to write versus what one actually does write, and it’s about the poems that keep following us around for a while, even when we think we’re done with them. At the time Guy was living with me, I was transitioning from an academic career track (say it with me, folks: “crappy academic job market plus paralyzing dissertation dread”) to being a writer. Over a span of several years, I sold some essays, got a job writing poetry reviews for an online bookseller, taught some business writing classes, edited some online courseware, wrote album and concert reviews for some local papers and zines, came close but got turned down for a Michener Fellowship at the University of Texas, and — with an unerring instinct for where the money isn’t — mostly wanted to write, perform, and publish poems. And I had some limited success. When I went to open mics, my poems were received well (but weren’t anybody’s favorites). When I went to poetry slams, I did okay (but didn’t win). When I submitted poems to journals, editors sometimes sent back appreciative comments (but only occasionally published the poems). But I was writing all the time; I was burning with it. Sometimes I’d start with a turn of phrase and run with it; sometimes I wrote scores of forced villanelles and awful sonnets, to build up my form muscles, because who knew when I’d want to write about something and only a sonnet would do? Sometimes I’d listen to instrumental music, and would write whatever flew into my head while listening. Sometimes I’d pull ten random words from the dictionary or from songs on the radio, or from Scrabble games, and I’d make myself write a poem that tied them together. Sometimes I’d start with moments of my own experience, and write a kind of lyrical reportage, like hey y’all, here’s what it was like to be in this moment. I felt myself on the verge of a breakthrough. One morning in 1996, I was making a pot of coffee and Guy was sitting at the breakfast table muttering. I remember exactly what he said. It was “Blah-blah-blah-B.B. King.” I love B.B. King, and so, even though I was pretty sure I’d misheard, I said, “What was that you just said?” And he told me: when Elvis was a misfit rube kid from Tupelo, transplanted to the big city of Memphis, he heard blues music on B.B. 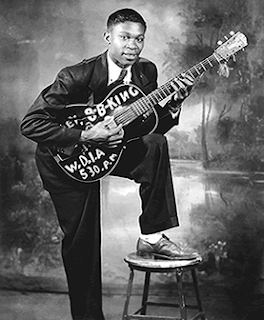 King’s WDIA radio show, and, as a teenager, went down to Beale Street to puppy-dog around after the guitar-slinger and radio host. King at this point wasn’t famous outside Memphis, but he was a local celebrity, and there was no particular reason for him to give the kid a second glance. But he liked him, and talked to him about music a little, was slightly encouraging. Well, I thought, this is the poem I’ve been fixing to write. What a great story! I could hear the rhythms of it in my head right away, and knew what the title should be. I told Guy, and he laughed, said, yeah, that’s just right. I wanted to write the poem as a conversation. It would be about a common love of the blues bringing together unlikely friends, and I wouldn’t sweat accuracy too much. After all, I was writing a poem, not an academic journal article. My brother was thrilled I was talking with him about Elvis and borrowing his books. He was looking forward to reading what he started calling my Elvis poem. But if the academic in my soul was dormant, he was not dead. I began reading up on Mr. B.B. King (born Riley King), and, you know, way leads on to way, and pretty soon the story of King’s own hard childhood edged out the story of his brief and casual friendship with young Elvis Aaron Presley. My original title fell away. For a couple of weeks, I became obsessed with the new poem I was writing. If a line produced no bliss for me, I killed it. King’s story was so uplifting, such a testament to the power of art to heal and uplift, and I myself — not least because of the disease that was killing my brother and that I knew might someday kill me — needed some healing and uplifting. And the poem I wrote, “Riley’s Blues,” took me to a new place as a writer, a place where I suddenly felt some authority of voice, saw that I could combine hope with hardship, could conjure in my lines a musicality that had not been there before. You might be wondering, so I’ll go ahead and tell you: no, my brother was not happy with me at all. “It doesn’t say anything about Elvis anywhere in here!” he said, hurt and betrayed. This bit of predictable Elvis fandom was a little funny, a little sad. Guy was losing his ability to reason outside some very narrow boundaries of understanding. I told him I’d written a different poem from the one I had set out to write, but that I was happy with it. Someday, I said, I’d pick back up the original idea of the Elvis-B.B. King poem. Really. And I meant what I said. That was 1996. Off and on, I tried to write the thing, but failed and failed and failed. My brother died August 16, 2003, and his death, though awful, was a blessing, because he had been suffering so terribly. In the weeks after the funeral I felt something nagging at me, and one October morning, I knew what it was. Easily, in one sitting, I wrote the poem I’d been stuck on for seven years. Somehow the mess of lines in my head and on various scraps of paper came together as a sonnet, and that long-ago title became my last line. Guy and I sometimes got along and sometimes didn’t. 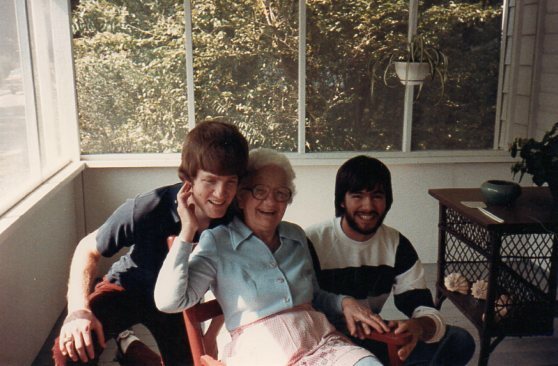 Here’s the two of us in our early twenties, during a good period, with my dad's mom, Grandma Ruth. Maybe you know this: the way it is between brothers can be complicated. I’ll never be square with mine. On this one matter, though, I can say — knowing what it would count for in our own set of books — hey, Guy, you know that poem I promised you? Here it is. Wow! He may have a few other things on his mind, but that is so great that you did that! 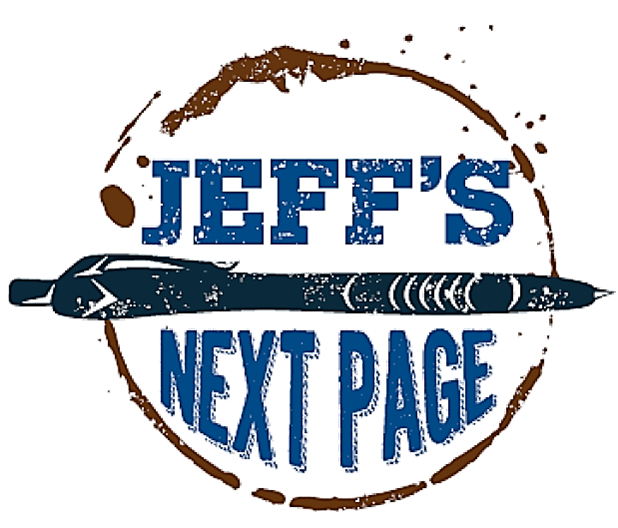 Jeff: Loved this. The poem and the story. So relate to your writing process.